„In eyes of Cyril Höschl“. Reflex 51/2005, p. 16. Waiting for extraterrestrials (Interiew). Reflex 2005/51:p. 20-23. „In eyes of Cyril Höschl“. Reflex 52/2005, p. 13..
„In eyes of Cyril Höschl“. Reflex 1/2006, p. 15. „In eyes of Cyril Höschl“. Reflex 2/2006, p. 15. „In eyes of Cyril Höschl“. Reflex 3/2006, p. 15. „In eyes of Cyril Höschl“. Reflex 4/2006, p. 12. „In eyes of Cyril Höschl“. Reflex 5/2006, p. 15. „In eyes of Cyril Höschl“. Reflex 6/2006, p. 19. „In eyes of Cyril Höschl“. Reflex 7/2006, p. 16. „In eyes of Cyril Höschl“. Reflex 8/2006, p. 20. Höschl C.: Mental health as an interdepartmental issue. Transcription of a speech on press conference "Transformation of mental health care: mental disorders and mental health promotion become priorities in european policy". Zdravotnické noviny, 8/2006, p. 9. „In eyes of Cyril Höschl“. Reflex 9/2006, p. 15. Is Islam really dangerous? Discussion with Gabi Bubulikova to the interview "Waiting for extraterrestrials. Reflex 2005/51". Reflex 9/2006, pp. 26-27. „In eyes of Cyril Höschl“. Reflex 10/2006, p. 16. „In eyes of Cyril Höschl“. Reflex 11/2006, p. 19. „In eyes of Cyril Höschl“. Reflex 12/2006, p. 19. „In eyes of Cyril Höschl“. Reflex 13/2006, p. 19. „In eyes of Cyril Höschl“. Reflex 14/2006, p. 19. „In eyes of Cyril Höschl“. Reflex 15/2006, p. 17. Höschl C.: Computers changed our inner world. Magazine Click" (Myself and my computer), XVII, 2006, 4:102. Höschl C.: New Year toast (not only) to the listeners of the Czech radio 2. Vita Nostra Revue, 2006, 2:4. Response to exquiry "Two questions for three deans of 3rd Medical Faculty of Charles University". Vita Nostra Revue, 2006; 1:30-34. „In eyes of Cyril Höschl“. Reflex 16/2006, p. 21. „In eyes of Cyril Höschl“. Reflex 17/2006, p. 20. „In eyes of Cyril Höschl“. Reflex 18/2006, p. 19. „In eyes of Cyril Höschl“. Reflex 19/2006, p. 16. Where is current psychiatry proceeding? Interview for Medical Tribune, 2006, II; 16 (15.5.2006):12. „In eyes of Cyril Höschl“. Reflex 20/2006, p. 20. „In eyes of Cyril Höschl“. Reflex 21/2006, p. 18. „In eyes of Cyril Höschl“. Reflex 22/2006, p. 17. „In eyes of Cyril Höschl“. Reflex 23/2006, p. 18. „In eyes of Cyril Höschl“. Reflex 24/2006, p. 18. „In eyes of Cyril Höschl“. Reflex 25/2006, p. 17. Psychiatry yesterday and now. Interview for magazine "Osmicka", June 2006, p. 8. „In eyes of Cyril Höschl“. Reflex 26-27/2006, p. 19. Commentary to the topic The Death live". Hospodářské noviny (Economical news), 7.7.2006. „In eyes of Cyril Höschl“. Reflex 28/2006, p. 17. „In eyes of Cyril Höschl“. Reflex 29/2006, p. 17. „In eyes of Cyril Höschl“. Reflex 30/2006, p. 15. „In eyes of Cyril Höschl“. Reflex 31/2006, p. 15. „In eyes of Cyril Höschl“. Reflex 32/2006, p. 15. „In eyes of Cyril Höschl“. Reflex 33/2006, p. 13. „In eyes of Cyril Höschl“. Reflex 34/2006, p. 15. „In eyes of Cyril Höschl“. Reflex 35/2006, p. 15. „In eyes of Cyril Höschl“. Reflex 36/2006, p. 19. „In eyes of Cyril Höschl“. Reflex 37/2006, p. 15. „In eyes of Cyril Höschl“. Reflex 38/2006, p. 18. „In eyes of Cyril Höschl“. Reflex 39/2006, p. 17. „In eyes of Cyril Höschl“. Reflex 40/2006, p. 19. „In eyes of Cyril Höschl“. Reflex 41/2006, p. 14. „In eyes of Cyril Höschl“. Reflex 42/2006, p. 18. „In eyes of Cyril Höschl“. Reflex 43/2006, p. 18. Interview for the magazine "Krásná paní" (Beautiful lady).4; 2006, 11:16-17. „In eyes of Cyril Höschl“. Reflex 44/2006, p. 18. Höschl C.: Syndrom zpáteční adresy jsme překonali (We overcame the backward address syndrome). Interview. Medical Tribune, 2, 2006+ 35:1, 9, 16. „In eyes of Cyril Höschl“. Reflex 45/2006, p. 18. „In eyes of Cyril Höschl“. Reflex 46/2006, p. 19. „In eyes of Cyril Höschl“. Reflex 47/2006, p. 17. Very rich people are often unhappy. Pražský Deník (entertainment and culture), 25.11.2006, p. 30. My favourite website. Respekt 48, 2006, p. 18. Höschl C.: Preferences vanishing? Asap new face: MFDnes, 30 Nov 2006, p. A10. „In eyes of Cyril Höschl“. Reflex 48/2006, p. 19. „In eyes of Cyril Höschl“. Reflex 49/2006, p. 15. „In eyes of Cyril Höschl“. Reflex 50/2006, p. 15. „In eyes of Cyril Höschl“. Reflex 50-51/2006, p. 20. Höschl C.: "Do not panic". Reply to the question in the column "Secret of the big doctors". Výběr (Selection), December 2006, p. 48. Höschl C.: On the principles of this world and decreased sensitivity. Graduation Speech of the Dean of 3rd Medical Faculty of Charles University (1996). Vita Nostra Revue, 2006;4:38-40.
Letters of Cyril Höschl, Reflex 1/2007, p. 19.
Letters of Cyril Höschl, Reflex 2/2007, p. 19. Relay race of Dnes (Today). Štěpán Mareš questions Cyril Höschl. Magazine Dnes (Today), 2/2007:4. Relay race of Dnes (Today). 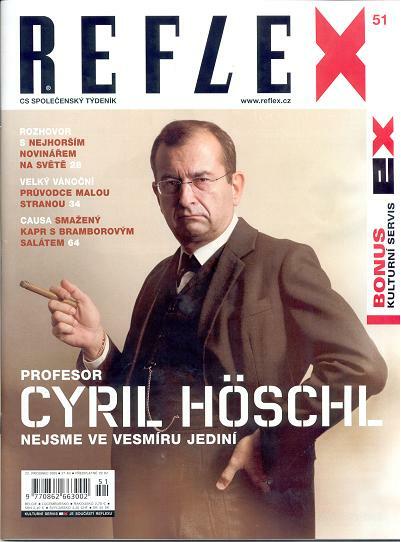 Cyril Höschl questions Václav Hudeček. Magazine Dnes (Today), 3/2007:4.
Letters of Cyril Höschl, Reflex 3/2007, p. 19.
Letters of Cyril Höschl, Reflex 4/2007, p. 19.
Letters of Cyril Höschl, Reflex 6/2007, p.19. Letters of Cyril Höschl, Reflex 7/2007, p.20-21. Letters of Cyril Höschl, Reflex 8/2007, p.20-21. Letters of Cyril Höschl, Reflex 9/2007, p. 18-19. What the society owes to the psychiatric patients? Discussion, Medical Tribune, 3, 2007; 5:2-3.
Letters of Cyril Höschl, Reflex 10/2007, p. 22-23.
Letters of Cyril Höschl, Reflex 11/2007, p. 22-23.
Letters of Cyril Höschl, Reflex 12/2007, p. 24-25. Höschl C.: Sigmund Freud and contemporary medicine (in Czech). Vita Nostra Revue, 2007, 1:44-50. Reprinted from Annals of the Centre for economy and politics 51/2006, Praha (Editorial revision). Höschl C.: How mothers program genom (in Czech). Vita Nostra Revue, 2007, 1:70-72. Reprinted from Leterární noviny 19.2.2007 (editorial revision of the lecture at interdisciplinary seminar Nature and Culture on the Novelty Crossroads, Nečtiny Castle, January 2007). Letters of Cyril Höschl, Reflex 13/2007, p. 18-19.
Letters of Cyril Höschl, Reflex 14/2007, p. 22-23. Participation in the querry "Do you exercise and follow the healthy cuisine?" MFD, 6.4.2007, D3. Letters of Cyril Höschl, Reflex 15/2007, p. 20-21.
Letters of Cyril Höschl, Reflex 16/2007, p. 24-25.
Letters of Cyril Höschl, Reflex 17/2007, p. 22-23.